"There's a little black spot on the sun today....."
This is cooler than it looks at first glance! 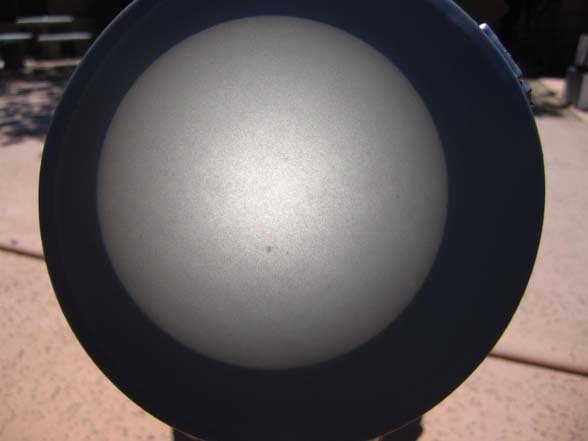 It is a projected image of the sun, through a telescope. See the sun spot there, lower center? The telescope was pointed at the sun, and the viewfinder was attached to a funnel, with a piece of silicon sheeting (used in projection tvs) stretched over the large end. The telescope projected the image from the viewfinder through the back side of the silicon sheeting. The resolution was very clear, very sharp, and safe to look at directly. This one of the many telescopes and demos set up at our local library, by our local astronomy club. April 20th (today) happens to be National Astronomy Day, which is part of our library's festivities of National Library Week.